The New York Times calls Anuvab Pal ‘India’s Most intelligent comedian’. The BBC calls him India’s answer to British wit. His stand-up comedy special The Nation Wants To Know, has played over 500 sold out shows from Mumbai to Sydney to San Francisco. His current show, Empire, a comedy show based on the history of the British Empire in India, has played in 12 cities worldwide and been called “Spectacular” by CNN and “A laugh riot with brilliant ideas” by NDTV. Empire had a hugely successful run at the Soho Theatre in May and has been brought back for a second week long run this year. The show was also a huge success at last years Edinburgh Festival Fringe, where he received rave reviews! Anuvab has been seen on BBC2 as part of the BBC’s Big Asian Stand Up shows, recorded at the iconic Leeds City Varieties Hall. He also featured in this years BBC World Service The New Years Stand Up Comedy Special which was recorded at the legendary BBC’s radio theatre in London. Excitingly, Anuvab will be making his TV debut on next season’s QI. Anuvab is the only Indian stand-up comedian after Russell Peters to sell out The Gotham Comedy Club in New York in record time. He’s also the only Indian comedian invited to perform at Harvard University. 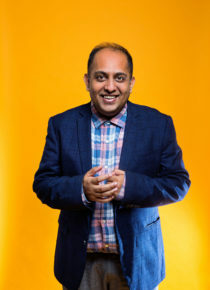 The Times of India lists him among India’s top 5 English speaking comedians, having played over 750 shows and sold out houses across India, the Middle East, Singapore, Hong Kong, San Francisco, South by Southwest Austin Texas, Laugh Boston, New York. Anuvab is turning his attention towards the UK, having been a regular at the London Comedy Store but looking to share his observations on the British influence of India and absurdities thereof. In 2016, Anuvab was chosen among the top comedians in India to have his comedy special available on Amazon Prime Video, among the premiere shows of Amazon’s India debut. The same year, he joined the hilarious pan-global satirical podcast The Bugle alongside Andy Zaltzman. It is with Andy Zaltzman that he has co-created the upcoming BBC Radio 4 comedy series Empire. Anuvab is also a prolific writer. He was the screenwriter of the Bollywood films Loins Of Punjab Presents and The President Is Coming, both of which have screened at leading film festivals around the world. He is also the author of 4 hit stage plays: 1 888 Dial India, The Bureaucrat, and Chaos Theory, which have become bestselling novels published by Random House and Picador respectively, and The President Is Coming, which was developed by the Royal Court Theatre in London. His work has been featured internationally in Time Magazine, CNN, BBC, Wall Street Journal, Huffington Post, Vogue, Elle, The Economist, FT, The New Yorker, and many other publications. He writes a weekly column for The Economic Times and Times Of India. Anuvab will be returning to the Edinburgh fringe this year with a brand new show Democracy and Disco Dancing.